A dance exhibition followed. Invited dancers Paola and Ruben took the floor to show their skills and us regular tango improvisers sat to watch their performance. They danced beautifully, but I honestly could not take my eyes off her, the elegant moves, her dark hair, the lean and strong body – “pilates instructor”, the blurb said – that was shown off by the predictably flimsy but unpredictably turquoise dress. No wonder Fabian was crazy about her; it was him and everybody else. I myself was endlessly fascinated by the amplified perfection of it all and, as usual, amazed by the fact that professional dancers can jump and turn with delicate, low cut dresses and bare backs! How do they get enough support? Ruben did a good job too and his precise movements allowed her to shine, but he looked pale near her and his casual suit didn’t do anything for him. As the exhibition ended, the band returned to the dance hall to take the stage over. When Mr. Gorgeous entered the room and we held our gazes again, it almost felt as if we had our own rehearsed routine. Of course I felt excited and, yes, I was glad we were renewing our demonstration of interest, but I sort of expected it. The fact that the man was performer himself and was there to be admired from a distance made the flirting business considerably less risky – would it even be possible for him to approach me at some point? His presence was immense, though, my thoughts and breathing ability were put on hold as he came close to me looking straight into my eyes. No smiles, this time, just intense eye contact and a slight neck turn, as he went past me. His attitude, I resumed my thoughts, had to be paired with great confidence and the awareness of his high attractiveness, which, granted, was obvious, but what did it mean for me? I mean, did my part on the flirt made me delusional, presumptuous or attractive? As the music started, John approached me for a dance. I liked dancing with him and the fact that we were becoming regulars. We never talked as we danced so I just let the music and Mr. Gorgeous’ velvety voice take me into a daydream. I wished he would stay in London. Flirting would be more real, I’d have butterflies for the whole night, maybe for a month, and I would definitely wait for the show to be over to create the opportunity for him to approach me. But what was the point when the band was leaving to Rome on the following day? It was almost 2 in the morning, I had been up since 6AM, travelled to Manchester and back and I was tired. I was also on a high from a great night and from having the hots for Mr. Gorgeous. Delusional or not, I was feeling more confident and excited about meeting someone new. Maybe that was enough. Waiting for the show to be over betting on a possible approximation did not seem like a great idea when even best case scenario had to end with him leaving on the following morning. 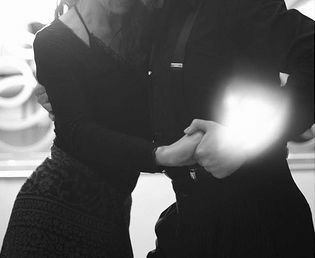 Mr. Gorgeous was not to be my second tango mistake, he was the trigger, an overdue platonic rebound, so to speak, and maybe that meant I was already getting wiser with one tango mistake on my bag. As the tanda was over, I thanked John and turned towards my table. I looked at Tina as she sat, chest forward, alert to the dance floor, which was filled by younger and less talented ladies, myself included. I went to say goodbye to her and was intercepted by Maximilian, who stood up, introduced himself as an instructor, asked me something about my tango training and said I was doing well. I thanked him and noticed a possible girlfriend looking at me as he suggested we should dance sometime. I agreed politely and extended my smile to the girl, nodding a ‘hi-goodbye’ to them just before resuming my way to Tina, who gave me a knowing smile as I approached her. She had gathered two small tango flyers for me, one for a place in which she took classes and one for shoes. I thanked her a lot, wished her a merry Christmas and started crossing the room near the stage. On my way out, I looked at Mr. Gorgeous intently, a ready smile on my face, but he did not see me, so I got to the door and went down the stairs to the cloakroom. I changed into my winter boots, put my coat on and was saying goodbye to the smiley Doug, the doorman, when Marcos sprinted into the room. — ‘Are you going now’? — ‘But it’s so early’. — ‘Will you make it to class this week’? — ‘There aren’t classes this week, Fernando and Cecilia are going to Argentina’. I picked the flier and could not help but smile back at him ‘Bye Marcos, bye Doug.’, I left to the door carrying a big smile, three flyers and some new plans.